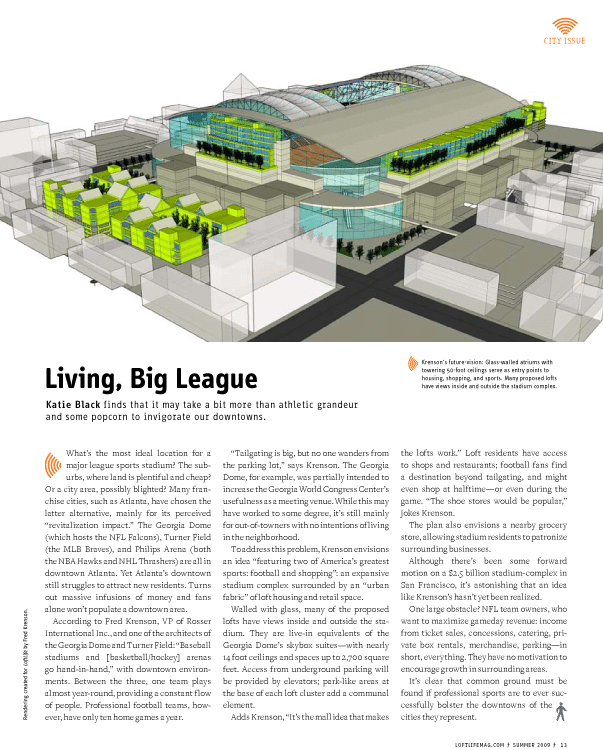 What’s your idea of the ideal location for a major league sports stadium? In the suburbs, where land is available and inexpensive? Or in the middle of a possibly blighted urban area, for its central location and possible revitalization impact? Many cities, such as Atlanta, have chosen the latter alternative. The Georgia Dome where the NFL Falcons play, Turner Field as home to the MLB Braves, Philips Arena as playing field for the NBA Hawks and NHL Thrashers—all are in downtown Atlanta. Yet Atlanta’s downtown continues to struggle to attract residents. Why hasn’t the massive infusion of money and fans helped to populate the downtown area? Fred Krenson, Vice President of architectural firm Rosser International, was one of the architects of the Georgia Dome and Turner Field. He is an advocate of downtown venues, saying that “baseball stadiums and [basketball/hockey] arenas go hand-in-hand” with downtown environments. Between the three sports, one team plays almost year-‘round. There is a constant influx of people in and out of downtown. Professional football doesn’t offer such a luxury. There are only ten home games a year in the NFL, and two of those are sparsely attended preseason games. “Tailgating is big, but no one wanders far from the parking lots or the stadium,” Krenson observes. The Georgia Dome was built adjacent to the Georgia World Congress Center, Atlanta’s convention center, in an attempt to increase its usefulness as a meeting venue. While to a degree this may have worked, it still is a use for out-of-towners with no intention or desire of living close by. The complex’s lofts surround the playing field with glass on two sides, both facing the outside and facing into the stadium. They are live-in equivalents of the Georgia Dome’s skybox suites. “The lofts have 13-1/2 foot ceilings and are 2400 to 2700 square feet,” he says. Access from underground parking is achieved by elevators. There are green spaces at the base of each loft cluster, park-like areas to congregate and enjoy the outside. Below the lofts, with no view into the stadium, is a shopping mall, accessed by escalators from the 11,000 available parking spaces. According to Krenson, “The mall idea makes the lofts work.” Loft dwellers can easily shop, eat, and drink. Non-resident NFL fans find a destination beyond a parking lot and tailgating. Fans could shop at halftime or even during the game. He jokes that “shoe stores would be popular.” The rest of the city also has an urban target, bringing their discretionary dollars downtown. Glass-walled atriums with towering 50-foot ceilings on the four corners serve as entry points from the outside, as well as gathering areas during the game. The “urban fabric” surrounding the complex hosts more lofts, independent shops and restaurants, whatever the urban dweller or visitor may need. Krenson envisions a grocery store in this area so residents of the stadium complex will be encouraged to leave the structure and patronize surrounding businesses. Given the popularity of mixed-use complexes, one wonders why a concept such as this has not been built. One large obstacle is the NFL team owner’s desire to maximize gameday revenue. Owners want income from ticket sales, concession sales, private box rentals and catering, merchandise sales, and parking. They have no motivation to encourage growth in surrounding areas. Common ground must be found that will allow stadiums such as Krenson’s to become reality and bolster America’s downtowns.